Kieran Hurley's Mouthpiece Soho Theatre tickets on sale now! 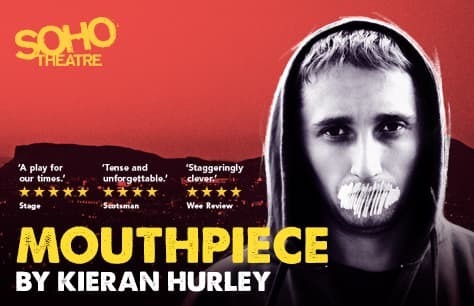 After a critically acclaimed run last year at the Traverse Theatre, Kieran Hurley's hit new play Mouthpiece has transferred to the Soho Theatre this spring for its official London premiere. Best known for his award-winning play, Beats, Scottish playwright Kieran Hurley is widely regarded as one of the UK's biggest emerging talents to watch, which is why you don't want to skip this limited engagement at the Soho this April and May. What is the Mouthpiece play about? Twilight engulfs the Edinburgh horizon at Salisbury Crags. A woman takes a fateful step forward whilst a teenager pulls her back to safety. Little do they know that their lives will be changed forever. Libby spends her days cafe hopping in New Town, still claiming to be a writer. Declan is a young artist with loads of potential but suffers from a complicated home life. The pair form an unlikely friendship made difficult by their clash of cultures and classes. When Libby identifies a weak spot that could help salvage her career and truly make a difference, we are left to wonder whether friendship is possible with someone we choose to exploit. Mouthpiece is a brutally honest tale filled with sharp humour that will catch you off guard when you least expect it. It offers a piercing look into the lives of two very different people who live in the same city yet seem worlds apart. Kieran Hurley is a multi-award-winning Scottish playwright and performer based in Glasgow. His most significant work prior to Mouthpiece is undoubtedly the 2012 play, Beats, which was staged at the Edinburg Fringe Festival for two consecutive years in both 2012 and 2013 respectively, later transferring to London's Soho Theatre in 2013. Beats was highly lauded and received a CATS Best New Play Award in 2012. Beats has been adapted into a major motion picture with Steven Soderbergh serving as executive producer. Hurley's other most recent triumphs include his 2018 play co-written with Gary McNair entitled Square Go, which was regarded as the 'funniest show' of the Edinburgh Festival by The Stage and won the Fringe First Award that same year, along with his self-penned and self-performed monologue, Heads Up, which won both the Fringe First Award in 2016 and the CATS Best New Play Award in 2017. Kieran Hurley's other prior credits include writing and performing the 2018 radio play-monologue for BBC Radio 4 entitled Edinburgh as well as 2012's Chalk Farm co-written with AJ Taudevin and his professional debut play Hitch at the 2010 Edinburgh Fringe Festival. You don't want to miss renowned playwright Kieran Hurley's award-winning show, Mouthpiece, at the Soho Theatre. Book your tickets now to avoid disappointment. 2 April - 4 May 2019. Contains frequent strong language, descriptions of violence, scenes of sexual nature and references to suicide. Captioned performance: Friday 26 April 2019.